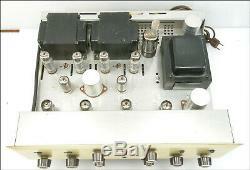 Scott 222C Tube Amplifier, Less than 10 hours, Original Tubes. This is exceptionally clean, less than 10 hours use, with all the original tubes. Circuit has all original parts, no repairs, no modifications. The 222C amp does not need a jumper connected to output impedence terminal. Amplifier has been serviced and lower than spec selenium rectifier was replaced with new production full wave rectifier. 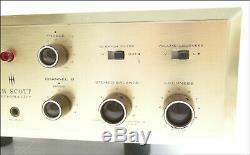 12AX7 tubes are original factory installed Scott labeled, black plate, 7025 (RCA, dated code 1961). Output tubes are factory installed Telefunken 7189. Rectifier is factory installed f33 Mullard 5AR4/GZ34 (date code 61-44, production code F33 L1G). I do not think anyone has discovered a 222C that was used for aprox. 10 hours and tucked away on the top shelf of a closet. The 222C is the Scott amp considered to be the best sound of the Scott tube amps. Note: this amp has the Scottsman label and the bakelite knobs. Each solder joint has a dab of paint to indicate factory tested solder joints. All mounted components are riveted. The faceplate has a minor scratch or two. No damage, no bent faceplate corners. I did find a unexplained minor spot (best guess: result of liquid spill) on the top deck, But that sums it up. A really great survivor (from the vintage car world). 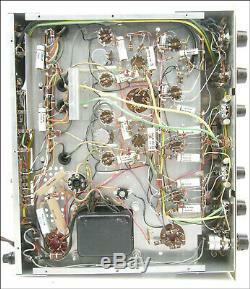 In spite of the extraordinary condition, note the Scott circuit components are almost 60 years old. The Scott is delivered in working condition and it sounds great. Cannot be responsible for life expectancy of 60 year old circuit components. 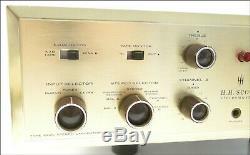 Be sure to have a experienced tube technician for help with advice how to upgrade this classic amplifier's performance. IMPORTANT - Be sure to read the Terms and Conditions of Sale. Hardware Packing - Domestic and Outside US: Item will be wrapped with bubble wrap in two directions and double boxed. Use of a friend's account or biding for a friend is not allowed. The item "Exceptional Scott 222C Tube Amplifier, Less Than 10 hours, All Original Tubes" is in sale since Wednesday, April 10, 2019. This item is in the category "Consumer Electronics\Vintage Electronics\Vintage Audio & Video\Vintage Amplifiers & Tube Amps". The seller is "wevtt" and is located in Waltham, Massachusetts. This item can be shipped worldwide.